Strategy Markup Language (StratML) is an XML-based standard vocabulary and schema for the information commonly contained in strategic and performance plans and reports. Its creators believe widespread implementation of this open, standard, machine-readable data format can elevate and expedite knowledge worker productivity to levels previously unthinkable. 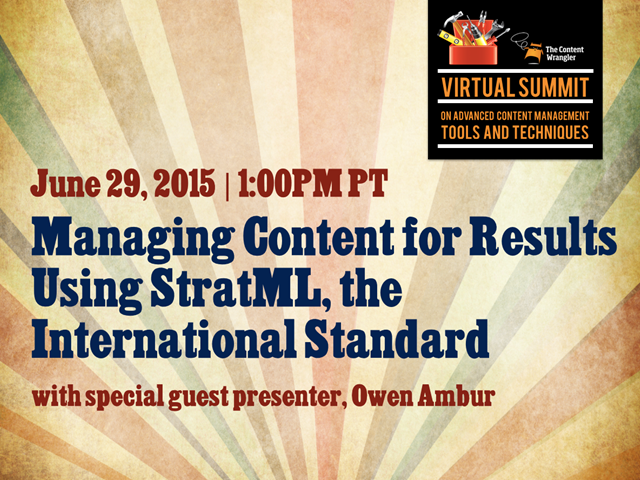 Join Scott Abel, The Content Wrangler, and Owen Ambur, Chair of the AIIM StratML Committee as Owen explains how this standard can be used to align content with strategic objectives. Owen will also explain why all of the existing social networking services are immature for business-quality usage and how, combined with an open, standard, machine-readable data format like StratML, they can be leveraged to elevate and expedite productivity to levels previously unthinkable. Owen will also demonstrate how a simple Web-based XForms form can be used to render plans in StratML format.